Transparency Market Research (TMR) delivers key updates and insights on the global lemon essential oil market, in its upcoming outlook titled, 'Lemon Essential Oil Market: Global Industry Analysis 2013-2017 and Forecast 2018-2027'. In terms of value, the global lemon essential oil market is estimated to account for a Compound Annual Growth Rate of 5.5% during the forecast period, bound to various market factors, regarding which, TMR offers imperative insights in detail. 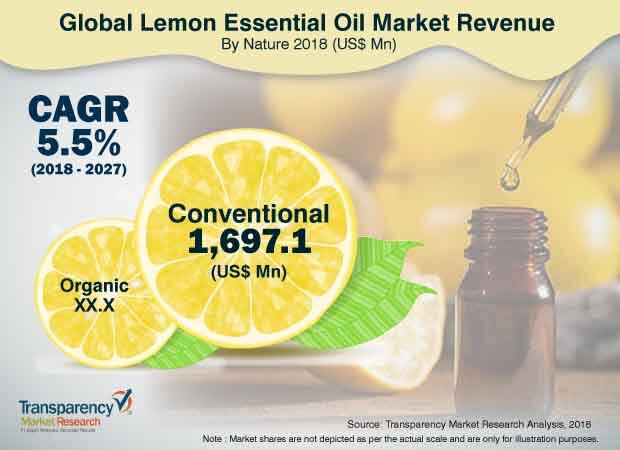 On the basis of end use, the aromatherapy segment is expected to maintain its dominance in the lemon essential oil market, with a significant CAGR of 6.5% during the forecast period. The increased demand for therapeutic and aromatic oils such as lemon essential oil across the globe due to the growing preference for harmless, convenient, and natural alternatives to traditional allopathic solutions has contributed to the high compound annual growth rate. Yet another factor for the stupendous growth is that, lemon essential oil is priced much higher than all other products in which lemon essential oil is an ingredient. As a developing economy with a higher prevalence of poor health conditions among the population suffering from respiratory complications, blood pressure, cancer, and others, Asia Pacific holds the highest growth rate of lemon essential oil as compared to other regions. As lemon essential oil has remunerative health benefits such as anti-carcinogenic and detoxifying nature, it contributes to the higher consumption, which is anticipated to drive the high growth rate of the lemon essential oil market in Asia Pacific except Japan, accounting for 6.9% during the forecast period. Specialty retail formats selling exclusive products in aromatic compounds has been gaining traction in recent years. Specialty products such as lemon essential oil have wider availability with various grades, which is anticipated to contribute to the high compound annual growth rate of 7.1% during the forecast period. Ethnic food is defined as food that is part of the culture and tradition of a particular ethnic group. These are mostly prepared from locally available materials, and are generally considered as healthy due to the use of natural or organic ingredients. Since it is costly to import ingredients that are specific to particular regions, manufacturers use essential oils such as lemon essential oil to mimic the flavor of the original ingredient. Since lemon oil is also plant-derived, it is considered natural and healthy. As a result, lemon essential oil is expected to witness significant increase in demand for application in ethnic food produced by food and beverage manufacturers, in the near future. This report covers the trends driving each segment, and offers various analysis, insights, and potential growth of the lemon essential oil market in specific regions. According to market attractiveness, Asia Pacific and North America are relatively more attractive regions in the lemon essential oil market. Based on end use, the lemon essential oil market is segmented as food and beverages, pharmaceuticals, aromatherapy, cosmetics & personal care, and households. TMR has profiled some of the most prominent companies active in the global lemon essential oil market, such as NOW Health Group, Inc., Citromax Flavors, Inc., doTERRA International, Southern Flavoring Company, Inc., Lionel Hitchen Essential Oils Ltd., Aromaaz International, Sunshine Products, Inc., Citrus and Allied Essences Ltd., and others, to provide a wider view of the market. Key manufacturers and product developers of global lemon essential oil are processing lemon essential oil in user-friendly forms, extract powders, and others. Lemon essential oil is also combined with other ingredients such as zests to provide additional benefits to consumers. Industrialists and manufacturers are planning to incorporate lemon essential oil in animal feed as an antibiotic supplement, due to the increasing demand for chemical-free products.